Add some spice to your contemporary yoga studio! 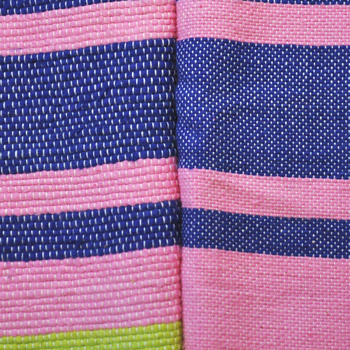 When style counts, you'll appreciate the vibrant colors in our 100% Cotton Hand-woven Yoga Blankets. 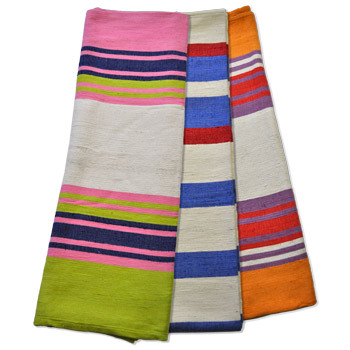 Bold stripes of hot pink, tangerine orange, sunset red and lilac blue give these yoga blankets lots of personality. They come in your choice of sizes and your choice of weave. Chose a heavier, dense weave for maximum warmth or a lighter, thinner weave for a lighter feel. Made from chemical-free cotton, these colorful cotton yoga blankets can be machine washed in cold water and air-dried. Order a large quantity of these unique cotton yoga blankets for your yoga studio or just a couple for your home. When not in use, this cotton yoga blanket looks stunning folded over your favorite leather reading chair. All of our cotton blankets can be hand washed and hung to dry. This 100% cotton yoga blanket is available in two sizes with your choice of weave -- some customers prefer a heavy, dense, tight weave for extra warmth, support, and stability, while others prefer a slightly thinner weave for a lighter feel. 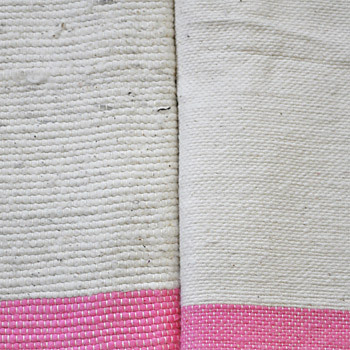 Made from chemical-free cotton, these yoga blankets DO NOT have any tassels, but rather have a thin, neatly stitched border. Each blanket is completely hand-woven and hand-finished. All of our cotton blankets can be hand washed or washed in front loading machines with cold water and hung to dry. I absolutely love this 100% cotton Yoga blanket. The Mexican blankets that are a blend of polyester/rayon bother my skin! So this one is colorful and soft and 100% cotton. Would highly recommend for people with sensitive skin. Lovely to look at and feel, BUT not appropriate as a 'yoga' blanket. I'm considering returning mine. Why? It doesn't sit/fold flat. There is a thick folded edge (hem) around the entire blanket (not just in the fringe end). That was not stated in the description. Fringe-free should have meant flat blanket-stitching, not this thick awkward edge. I asked for pink, and thankfully this blanket has lots of pink! It is larger and more beautiful than we expected! What a great company, we have ordered from them before and will continue to do so~ Thanks so much! I ordered these blankets because they are 100% cotton, it's hard to find yoga blankets without rayon and polyester, etc... I am thoroughly pleased with the quality, look and feel of the blankets. I ordered the 'heavy' weight, but be aware they are not heavy like the blankets made with blended materials, they are lighter and far more breathable and oh so soft. I did machine wash and dry these blankets, they need to be put in the dryer immediately after the wash cycle so the colors don't bleed. After purchasing one blanket I returned to purchase two more. When not in use for yoga purposes these blankets make a beautiful accent laid across the bottom of my beds, I highly recommend these blankets. I am so happy with my purchase of this colorful, well made, and soft Yoga Blanket. I bought the lighter weighted one. It is exactly how it's described.I highly reccomend it!